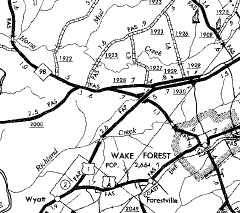 History: NC 98 was born about 1934 as a renumbering of part of NC 581, running from NC 91 (now SR 2053 Jones Dairy Rd) Wake Forest east through Bunn to US 64 (now Dadysville Rd). In 1940, NC 98 west was truncated to a relocated NC 91 (now NC 96). West to Wake Forest became part of NC 91. In 1941, NC 98 west was extended as new primary routing to US 1 (now US 1-A) Youngsville. In 1952, NC 98 was rerouted to head west through Wake Forest and ending in Durham, replacing NC 264. The small piece northwest to Youngsville became part of NC 96. In 1975, NC 98 was extended east to its current end replacing a bit of US 64. 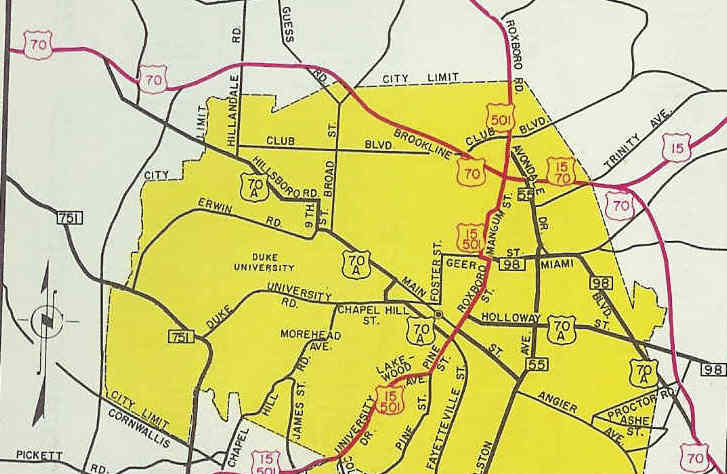 Also in 1975, NC 98 was rerouted in Durham. 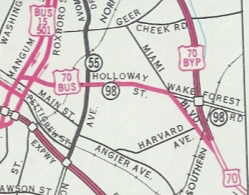 Up to then, NC 98 used Wake Forest Rd, Miami Blvd and Geer St to end at US 15-501 Roxboro St. Now, NC 98 was sent with US 70 Bus on Holloway St to end where it met US 15-501 Business. The old wat has been secondary ever since. In Sept 1978 (NCDOT), NC 98 was extended east replacing US 64 through Spring Hope and ending at the west end of the US 64 Nashville bypass. 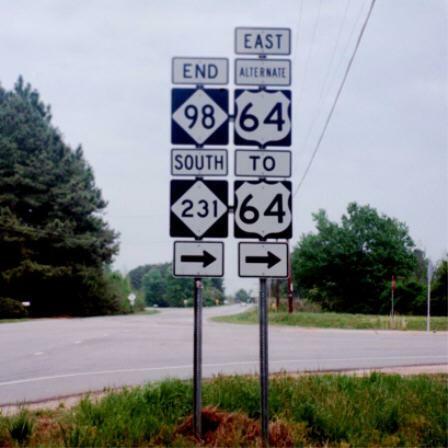 In Nov 1978 (NCDOT), NC 98 east was truncated back to NC 231, replaced by US 64-A. About 1980 (bridge dates), NC 98 was rebuilt to avoid parts of the new Falls Lake. This left behind Old Keith Rd and "Old NC 98". About 2005, NC 98 was placed on a new bypass south of Wake Forest, then a duplex with US 1 back to original NC 98. The old route through town is NC 98 Business. The first NC 98 was born in 1930 as new primary routing from NC 91 (now US 264A) near Wilson southeast to NC 102 (now US 13) near Snow Hill. In late 1931, NC 98 became part of NC 58. Today it is still part of NC 58 except it used Main St/Commercial Ave through Stantonsburg and in Greene County NC 98 used the Old Stanburg Rd and Nooherooka Rd loops. Comment: NC 98 is a decent route to use from Durham to areas on US 64 well east of Raleigh.